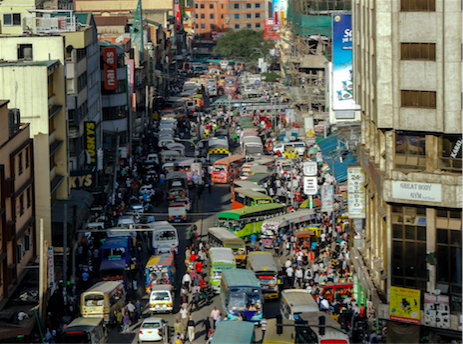 Nairobi, Kenya – a massive, sprawling African city with a total population exceeding 6 million, and horrific traffic of legendary proportions. Now, try to grasp the fact that there are only 2 or 3 strongly biblical churches in the entire city. Then factor in that most residents do not own cars. Traveling any distance to a church meeting is complicated by catching multiple buses and taxis. How would you like to do that every Sunday with your entire family? Meanwhile, congregations of the prosperity cult are meeting on almost every city block. 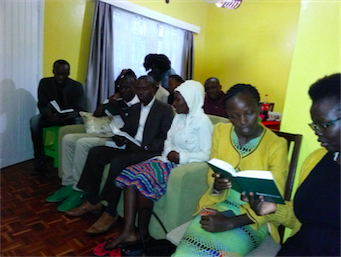 Another important factor is the former members of Reformed Baptist churches in other parts of Kenya who relocate to Nairobi. 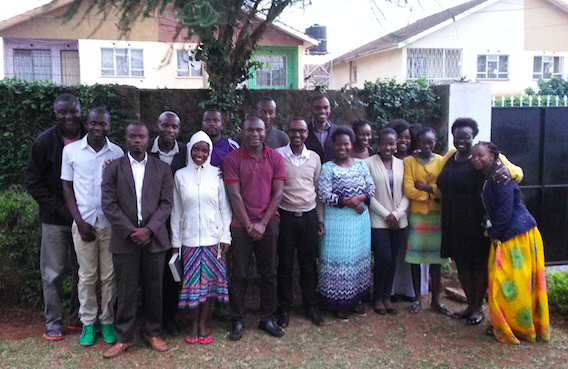 Some of these are college students who were reached by the churches in university towns like Kisumu and Eldoret. These students were evangelized and discipled by Bible-preaching churches and grew to love sound doctrine. However, upon graduation, they move to the ‘big city’ where there is far greater hope of finding work. Others are forced to move due to a job transfer. Depending on where they live in the city, reaching one of those 2 or 3 biblical churches can be extremely difficult. We have also learned from the experience of the Zambian Reformed Baptists. Over three decades, a handful of strong churches in the capital city of Lusaka have provided the manpower and finances to sustain a church-planting movement across their country and beyond. Lusaka, with a population of 3 million, has close to a dozen good churches now, while Nairobi, with double the population, has only a couple. I have long desired to see our Kenyan brothers launch a new church in Nairobi. But who would undertake such a daunting task? Sam Oluoch, and his wife Melly, felt a growing certainty that they were the ones to go. In discussions last year, their fellow Kenyan pastors confirmed that calling. Our trusted African leader, Pastor Conrad Mbewe, added his enthusiastic endorsement – yes, Sam is the man for the job. 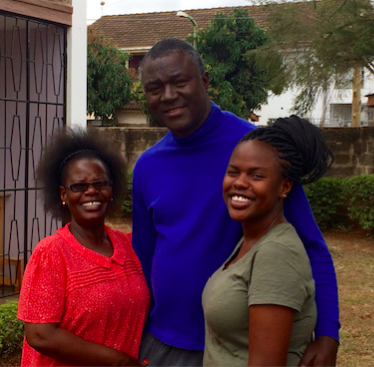 The Lord used Sam and Melly (left with daughter Nila) to establish Grace Baptist Church many years ago in Kisumu, Western Kenya. The church is now strong and healthy, and Sam was ready to leave it in the hands of his co-elder, Ken, and a new pastor. Sam is a seasoned pastor and skilled evangelist, and he was ready to apply that gifting and experience to the challenge of Nairobi. Despite the pain of losing their beloved pastor, Grace Baptist was willing to follow the biblical example of Antioch (Acts 13) and give of their best for the cause of the Gospel. In May 2018, Sam’s family made the move to Nairobi. There was sorrow in leaving their church family and uncertainty in starting again from zero. 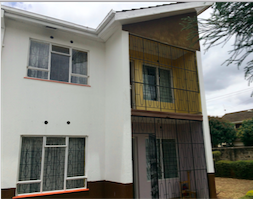 They left a peaceful home with a view of Lake Victoria for the noisy, crowded city. Like so many others, they looked to an eternal reward as they left friends and home to follow their Lord. The move held other major challenges. How would they find adequate yet affordable housing in Nairobi? Yet through friends from a former church, the Lord provided a good house to rent for far below the going price (right). Sam and Melly had also survived all these years in ministry with the home furnishings they acquired while he worked for the government. Those furnishings had seen their last days, and Sam feared they would not survive the move. When I visited their Nairobi home in July, I wondered what I would find. Through the generosity of family and friends, I arrived to a fully furnished home! Our Lord always provides for those who trust Him and obey His call. 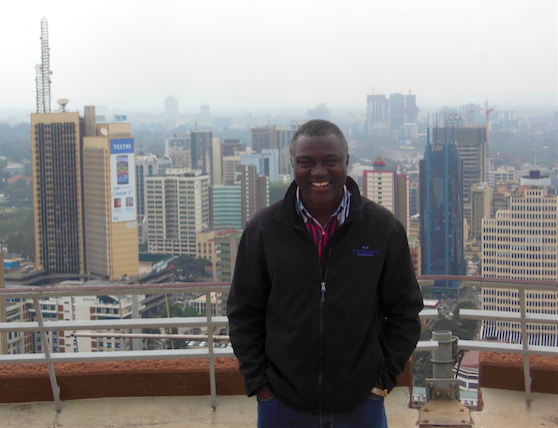 Sam arrived in Nairobi with a list of 15 contacts, and that list quickly grew to over 20. Some were former members of the church in Kisumu who had relocated to Nairobi for work. Others were former university students that Sam used to evangelize in Kisumu. 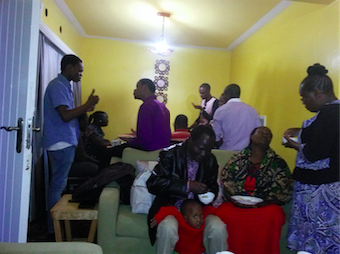 In the first month, Sam and Melly averaged 12-18 people in their home every Sunday night for Bible study. They are working through the Gospel of John, and the majority of those attending are not yet believers. One of those, Duncan, has recently professed faith (see last week’s blog article). Sam told me that he had to restrain himself on following up with all their contacts, because they could not fit any more in their home! They could easily have 20-25 meeting for Bible study if they had the space. A better meeting facility became a matter of urgent prayer. One after another, each promising prospect fell through. Finally, on the very day I was leaving Nairobi for Uganda, Sam secured a rental agreement on a meeting hall. Another answer to prayer! Since the beginning of the year, we have seen God’s faithfulness demonstrated over and over in the launch of this new work. Therefore, we have every reason to continue praying boldly that He will prosper this church plant and call many to salvation in His Son.